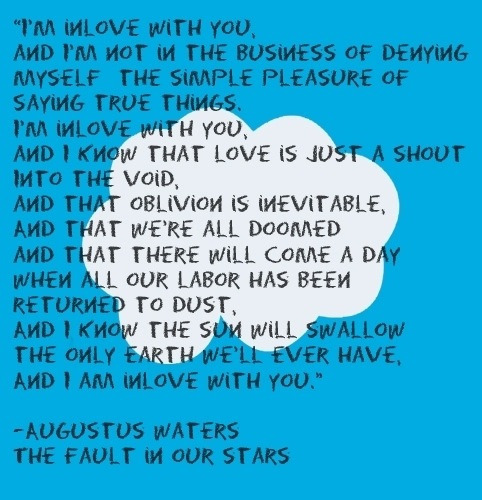 Now, have you guys watched the movie version of The Fault in Our Stars by John Green. If you not, I would recommend you to go and watch it now before they stop playing it. It was absolutely brilliant. My tears went down like a stream of river, non-stop. Luckily the time I watched this movie, it was Tuesday afternoon, so seats were empty. I wanted to sobs so hard while watching it, but thinking there were few people behind me, I had to hold my sobbing. Crying without sound is so unsatisfying. I have read the book but never once I cried. The movie blown me away. I think I need to re-read the book, immerse myself into Hazel Grace Lancaster's world and be prepared to have the side effect of dying, depression. I am going to intentionally depressed myself with this book, a good kind of depression. LOL. Go and watch the movie! And read the book as well. This movie is totally awesome ! Movie ni memang tak dinafikan ke-awesome-an nya. Haha. Buku belum habis baca lagi...best ke? Bukunya orang cakap best, menangeslah etc. Tapi bila aku baca tak menangis pun Mungkin kurang penghayatan kot. Sebab tu nak baca semula. Tapi kalau movie dia, perghh terbaik.